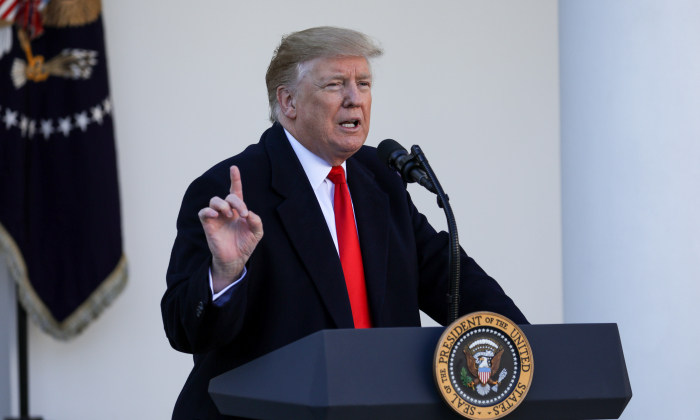 President Donald Trump said on Jan. 26 that the recent layoffs at BuzzFeed and HuffPost are the result of “fake news and bad journalism” and suggested that other outlets may suffer the same fate. “Fake News and bad journalism have caused a big downturn. Sadly, many others will follow. The people want the Truth!” Trump wrote on Twitter. BuzzFeed and HuffPost laid off more than 1,000 employees in the week leading up to the president’s message. BuzzFeed laid off 15 percent of its workforce, or about 200 staffers, according to a memo sent to employees obtained by The New York Post. Verizon, HuffPost’s parent company, announced a 7 percent workforce cut in its media group, which also contains Yahoo and AOL. The president frequently criticizes the media for what many perceive as one-sided coverage of his presidency and false reporting. Days before the layoffs were announced at BuzzFeed, the office of special counsel Robert Mueller issued an unprecedented statement disputing a BuzzFeed story on Michael Cohen. HuffPost is known for regular negative coverage of virtually every aspect of the Trump presidency. Since Trump took office, establishment media has churned out overwhelmingly negative coverage. According to the Media Research Center, the overall tone of coverage on Trump on network television remained at 90 percent negative in 2018, the same level measured in 2017. In a pair of follow-up messages about the indictment of Roger Stone, Trump pointed to the opposition research “dossier,” a document paid for by the Clinton campaign and published, without verification, by BuzzFeed. “CBS reports that in the Roger Stone indictment, data was ‘released during the 2016 Election to damage Hillary Clinton.’ Oh really! What about the Fake and Unverified ‘Dossier,’ a total phony con job, that was paid for by Crooked Hillary to damage me and the Trump Campaign?” the president wrote on Twitter. On Jan. 26, British newspaper The Telegraph issued an apology to First Lady Melania Trump for an article about her which “contained a number of false statements, which we accept should not have been published.” The Telegraph removed the article and noted that the newspaper agreed to pay substantial damages and legal costs.